Legendary Nokia 3310 Is Back, Here’s What It Looks Like In Its 2017 Makeover! 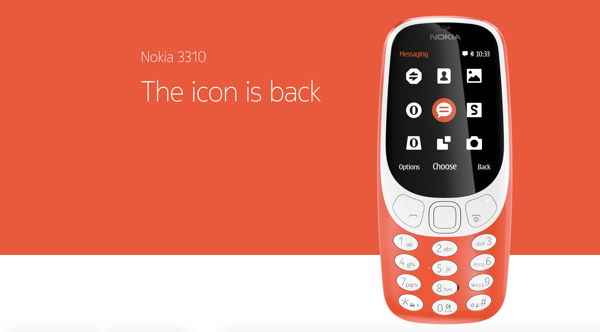 As promised, and as previously reported, Nokia has officially re-introduced the legendary Nokia 3310 at this year’s Mobile World Congress in Barcelona. Any individual of a certain age who was lucky enough to be a part of the mobile telephone revolution in the late 1990s/early 2000s will highly likely be aware of just how popular Nokia’s virtually indestructible 3310 was, with reliability and high build quality being two of the primary drivers behind the device’s phenomenal worldwide success. In a consumer technology world dominated by smartphones and tablets, Nokia is clearly looking to make a little bit of a splash amongst those consumers who yearn for the simplicity of yesteryear. Granted, the gorgeous little device is definitely not going to compete with the capabilities of the likes of Apple’s iPhone and Samsung’s Galaxy S range of hardware, but nor is it being positioned to even try. 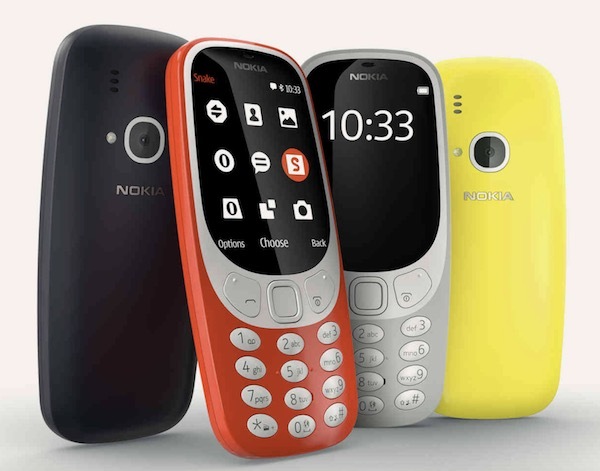 In fact, it seems that Nokia simply wants to bring back reliability and attempt to make a quick killing off those who loved the original 3310, and who will be more than happy to part with just $50 to own this new version. 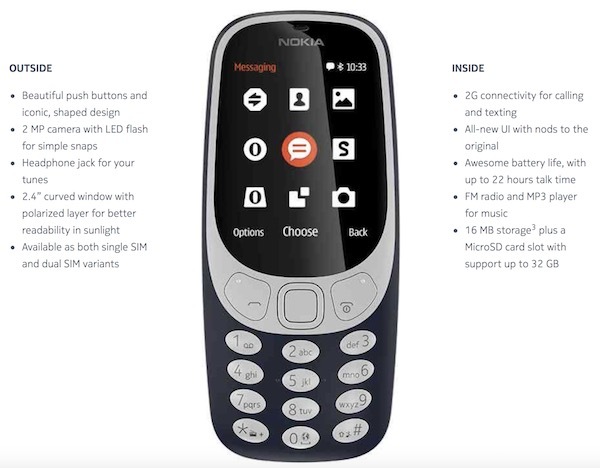 One thing that is immediately apparent is that Nokia, or actually the Finnish company which now owns the Nokia brand, hasn’t tried to make an exact clone of the original 3310 hardware. This new version does have clear similarities, and is immediately visually recognizable as the same device, but it has been somewhat modernized and injected with a splash of new color which simply makes it stand out and look stunning. Nokia has even taken the opportunity to inject a little additional power into the device in order to allow it to compete in today’s modern market. The device is powered by the Nokia Series 3.0 OS, and should bring with it more than 22 hours of talk time on a single charge. If you don’t wish to actually talk, then you should be able to get up to a months worth of standby out of it. From a modern perspective, users can slot in a microSD card for up to 32GB of storage, and it can even play MP3 files, and comes with a 2.4-inch QVGA display which is the perfect window to play the wonderful Snake game. There’s a 2MP camera as well. For $50 it’s an absolute steal, and will be available in Warm Red, Yellow, as well as Dark Blue and Gray colors. While Nokia has confirmed global availability of the device at launch, there’s no concrete date as to when exactly will it go on sale. We will of course update whenever Nokia makes the release date official. Stay tuned for more. …but does it have snake? Yeh I agree idk how this even made it to become a post on here. This phone is trash and I wouldn’t use it if it were free. If that’s true about the 2g data then att won’t be available for this phone. Which is 1 of 2 of the best service providers, the other being Verizon. The largest carrier in Australia has also recently stopped 2G support. Yeah I read a story a few weeks ago (possibly on here) saying the iPhone 2G is “dead” as it’s no longer supported on at&ts network. Stop guess, people. I am sure it is 4g and not 2g. It is great for people who cannot afford the smartphone like iPhone and Samsung. Have a respect, people. Don’t be a jerk! There are $100 phones that are 10 times better. Undeveloped countries now have LTE. It’s 2g. What would be the point of a 4g phone if all itv can do is text and call? It’s running on an old antiquated signal which will be obsolete very soon. Even people in poor countries would have binned their original Nokia 3310 phones as you can get much more advanced phones for the same price. Great phone for grandma and grandpa. No wonder Nokia threw away their dominance with asshat decisions like that. Nobody even has 2g anymore, the spectrum’s been resold for worthwhile purposes. 2G uses alot less juice, hence how Nokia is able to get the awesome standby and talk times! There are $200 phones that are 15 times better than a $100 phone, and there are $600 phones 15 times better than $200 phones, repeat repeat repeat…………. You don’t get it do you ? Some people are not afford 100 dollars. This is the better opportunity for them to be affordable. Maybe it is 3G.. Who knows. Just wait for more further information when it is available. Who the hell wants talk times and stand by times in the world of apps, data and impressive handy camera phones? huawei and samsung have similar prices. What carriers still offer 2G service? For less you can get the corpse of a dead Windows Phone/Mobile. It’s 2G and no wi-fi. Nah.. Keep deluging yourself, alright ? Be friendly, thanks. Unfortunately it doesn’t have 3G though, won’t work in many places. Saw a great 5.5″ Android device my mate got for aud$49 on special from the supermarket recently, THAT’S what I call good value not this. I know this is not a NOKIA, it is just chinese junk licensing the brand, but it’s not a 3310 in any way shape or form, so why reuse the model number?